What better place to read than a university right outside of the library? And who better to read to than your little brother? This is an image from a family and maternity session combo. The couple, whom we went to church went, were expecting their 3rd child in about a month. We had done the family photos, the maternity shots with mom and dad and were looking to find another spot to get some images of just the boys. 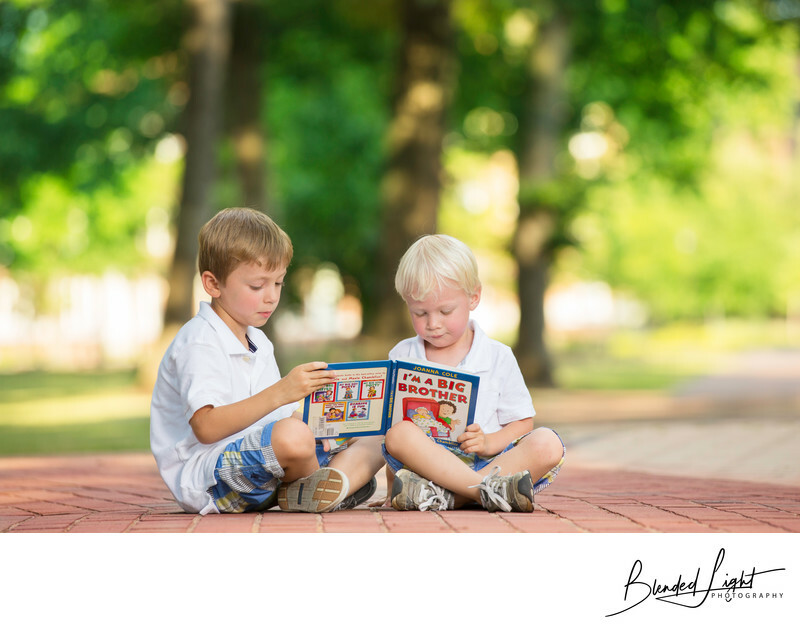 As will happen during an hour long photography session, the two boys were becoming boys, running out of interest in pictures and listening, so mom asked them to sit down and read together. And, well, they did. I had dad help me inconspicuously turn my flash towards the boys so as to not draw attention to the fact that they were about to become the only subjects of the next few shots. And they did great in their interactions? Normally for portrait images, I darken the background a little bit by underexposing it in camera. But for this image, I choose to leave it all natural and properly exposed. The sunlight hitting the shrubbery in the far aground against the trees with less light made for a very pleasing background. Laying on my stomach on the ground, I shot this at 200 at wide open to completely compress and blur the background - I basically wanted nothing but our "readers" in focus. I wanted to throw enough light on the kids to eliminate any facial shadows from sitting under trees as well as get some light on the cover of the book. I mean, really, what's the odds that current big brother would read a book called "I'm A Big Brother" to his little brother, who was about to become a big brother too? I'm guessing pretty low that it happens regularly! 1/500; f/4.0; ISO 320; 200.0 mm.